We are now season five of heating our place with our Harman XXV pellet stove, all started in the October 2009-2010 heating wise. Still super very happy with our choice to heat our house with our Harman pellet stove. Can’t imagine how much our place would cost to heat with oil, especially given how warm we keep our house. Damn our house is hot, each year the temperature we keep our house at seems to creep up. Keeping our place at 70 seemed amazing the first year, now our house is rarely below 76. It’s not very green of us I know, but the cost seems so minimal. Cost wise, we are still using between 750-1000 dollars worth of pellets a year to keep our house in Vermont at 76. A pellet stove is a lot of work (false), I still hear this one, and think people confuse wood stoves (especially old ones) with pellet stove. Since they both burn wood, many people seem to think you need to always be cleaning them, filling them, they are a pain to start etc all things so far from the truth. With a good stove and pellets, there is little in the way of maintenance besides carrying a bag of pellets to our into the hopper. Who couldn’t use a little exercise of carrying a bag of pellets a day? Discussion with friend on heating with Oil, oh my!!! I am sure sometimes my jaw must have hit the ground. 5000 a year to heat your house to 68? Well I am on a payment plan it is 260 a month. SO you pay 3100+ a year to keep your house barely 60? 3500 a year and my house is so cold. I was agast, with the cost but at 3.80 a gallon for oil, doesn’t take long to spend that amount. I know each house is different but at what point do you stop and think, that you need to make some changes in how you heat your house. Add insulation, install a pellet stove or wood stove, etc. Can’t see spending thousands of dollars a year on Oil heat that seems to only go up each year. 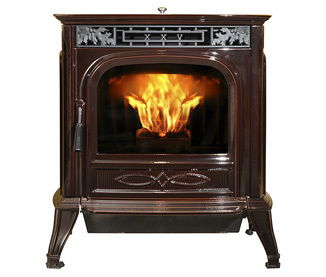 Buy a good pellet stove, if you plan on running the stove 24/7 during the heating season. Everyone I know that has a Harman, which is a lot of us, seem very happy with their stove, and most run it 24/7 like I do for months at a time. I am sorry to say but you cannot compare a cheapo stove you fire up once in a while and say it works just as well. I find it similar to comparing how old a car is without mentioning how many miles you put on it. A big difference with a 10 year old car that gave you no problems that was driven 250,000 miles and one that is always breaking down that you drove 30,000 miles. Pellet stoves are very similar, if you plan on running your stove all the time buy a good stove. Buy good pellets, I had the experience at the tail end of the heating season the past few years of using cheap pellets. Oh my what junk most of them are, and yes they do burn sort of. The ash content was not even listed, a bad sign, or a BTU count, or could be found tested by any pellet site via google. I opened some bags to find so much dust and smashed pellets it was not even worth burning them for fear of jamming my stove. The old, you get what you pay for. Buy a Safe stove, I know on our stove there is multiple safety devices and sensors. The one I run into all the time is the hopper air lock. There is not just some simple contact switch where you put the pellets but an air lock. As soon as the air lock seal is broken, by opening the door to put pellets in, the air fan and augur feeding the pellets stops. It is a great feature, the stove won’t continue to feed pellets and keep them burning hot with the hopper open. There is a small risk of the gases coming up the hopper chute, so a great safety device in case it is kept open. On more then one occasion the stove went “out” because I did not fully shut the hopper door, sometimes when it looked like it was shut too. I was glad of that feature, no matter how small the risk of gases entering the house, I was glad the stove went out. Purchase for the long view, have a friend who mentioned this week she was going to buy a pellet stove and was wise about it. She was not interested in how much she would save right now but how much the next 5/7 years. The added flexibility of having multiple heat sources. She heats with wood, cheapest option in most cases, but having a pellet stove means she can have a continual source of heat. Her Oil furnace won’t kick on when she is gone all day, or forgets to load wood. Flexibility was key in her looking at pellet stoves with a secondary emphasis on low maintenance. Maintenance wise, the augur on our stove was replaced 2 years ago. The augur was making a lot of noise and being still under warranty, we felt it wise for them to replace it. The technician that was sent to our house agreed hole heartily. I am going to be looking at installing a battery backup and/or maybe even a solar source for my pellet stove power. I have been measuring my stoves electric draw, which fluctuates between 60-100 watts, not a huge amount but enough of a draw in any case given I run it 24/7. As a hobby, I tinker with solar projects, and have built my own panels with the help of my daughter and have a small solar system with battery bank in our backyard. Not enough of a battery bank to power our stove reliably 24/7 though.The panel ends up putting out between 60-90 watts, but with a good but lower cost inverter, not enough headway without some expensive batteries. Top on the list is what happens if the power goes out? Having enough power to run the stove for maybe 1/3 the day would be a great. With our existing solar setup we have the ability to recharge the batteries during the non-running time. Maybe in the end we will have enough to run the stove off of just solar? Yes, I know you can buy backup settups but what fun is that and?